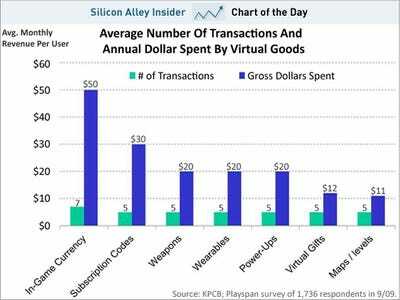 In Mary Meeker’s latest huge presentation on the future of technology, she includes a slide projecting the virtual goods industry to total $2 billion in the US for 2011. In case you’re wondering how the $2 billion market breaks down, she helpfully included another slide breaking down the industry. As you can see, in-game currency is the most popular way to spend real dollars on fake goods, with maps/levels the least popular. Click here to see the rest of her presentation which is loaded with interesting charts like this.